May 6, 2014 Archives - Clarksville Sports Network - Clarksville Tennessee's most trusted source for sports, including Austin Peay State University. Clarksville, TN – Like so many great games, it came down to one play. The top two seeds in the District 10-AAA softball tournament: The Clarksville High Lady Wildcats and the Northeast Lady Eagles- faced off at Clarksville High Tuesday, May 6th, and the game was decided by one play. Tied 1-1 in the top of the sixth inning, a missed ball at third base allowed Autumn Adams to steal home and score the run that let her Lady Eagles defeat the Lady Wildcats, 2-1. Northeast Softball gets 2-1 victory over Clarksville High. Colorado Springs, CO – The Nashville Sounds opened their road trip on the short end of a 4-1 defeat to the Colorado Springs Sky Sox on Tuesday evening in the opener of a four-game series at Security Service Field. 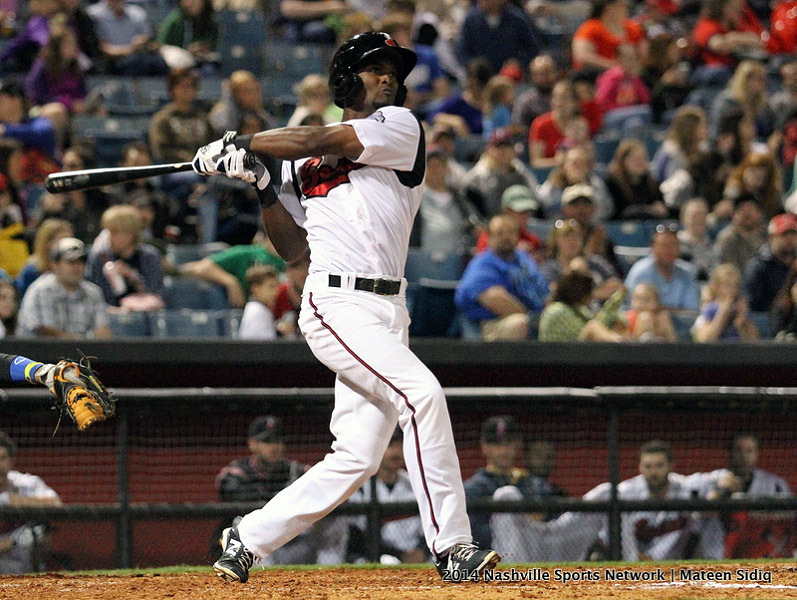 Nashville (18-14) fell into a tie for first place with Round Rock with the defeat. The Sounds are just 3-6 in series openers this season. Indianapolis, Ind – The Great Midwest Athletic Conference released its 2014 Men’s Golf All-Conference awards and Trevecca Nazarene University, the 2014 G-MAC Champions, is well represented throughout the team. Trevecca’s coach, Robbie Wilson, was named the coach of the year while Stephen Williams was named the 2014 G-MAC Player of the Year. Stephens and teammates Logan Martin and Tyler Phillips also made the 2014 G-MAC All-Conference team. Indianapolis, Ind – The Great Midwest Athletic Conference released its 2014 Women’s Golf All-Conference awards and Trevecca Nazarene University, the 2014 G-MAC Champions, is well represented throughout the team. Trevecca’s coach, Michael Johnson, was named the coach of the year while all four members of the team that played in the conference tournament were selected to the all-conference team. The team members are: Kaylon King (SO/Hartselle, Ala.), Alexa Rippy (FR/Clarksville, Tenn.), Mikayla Dodson (SO/Sante Fe, Tenn.), and Marlee Ingham-Stecker (SO/Dickson, Tenn.). Clarksville, Tn – Austin Peay State University softball senior Lauren de Castro has been named first-team all-conference by the Ohio Valley Conference’s coaches and sports information directors for the third consecutive season, as announced Tuesday by the conference office. Clarksville, TN – The Springfield Yellow Jackets rallied in the bottom of the seventh inning to send their second District 10-AAA baseball tournament game against the Kenwood Knights into extra innings, Monday, May 5th at Rossview High School. Then, they capitalized on an error in the tenth inning to win the game, 9-8, and eliminate the Knights from the tournament. Springfield senior Jackson Cobb stole home to win the game for the Yellow Jackets. Cobb was walked by Kenwood relief pitcher Will Kopke, after which he promptly stole second base. Later, as Cobb attempted to steal third, the Kenwood catcher threw the ball over the stretching third baseman. As a result of the bad throw, Cobb continued to steal third and score the game winning run. 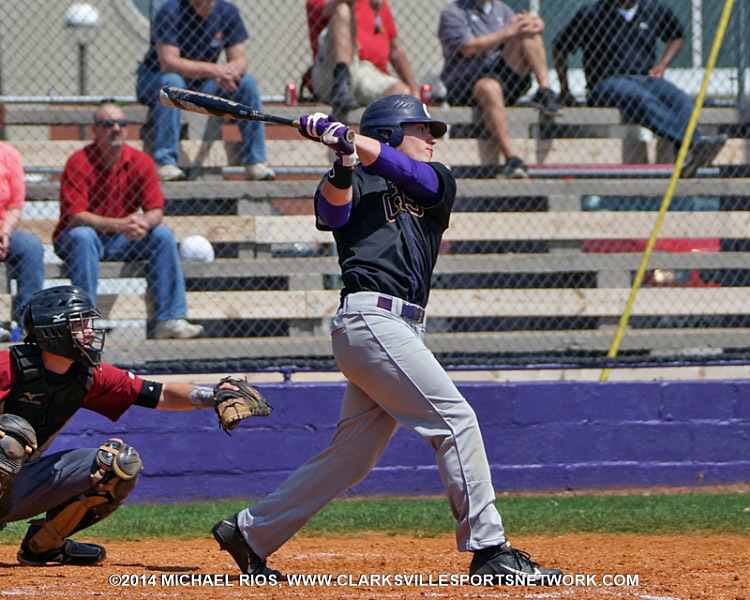 Clarksville, TN – Leading by a narrow 5-4 margin after three-and-a-half innings of play, Clarksville High School’s baseball team exploded for nine runs in its final two at bats, May 5th, to defeat Henry County High School 14-4 – in five innings – to remain undefeated in the District 10-AAA Tournament. The Wildcats (26-5) will advance to the tournament finals at 7:00pm, on May 6th and host the winner of the elimination game between Northwest High school (7-25) and Henry County (17-11), scheduled to start at 4:30pm at Clarksville High’s Baseball Field. Clarksville High gets 14-4 win over Henry County in 10-AAA Baseball Tournament. Clarksville, TN – The District 10-AAA baseball tournament continued Monday, May 5th with a pitching duel between Rossview’s Brett Wilson and Northeast’s Ben Wilford. Despite the Eagles best efforts, the game was decided early. The Rossview Hawks plated two runs in the first inning and it turned out to be all they needed for the win. Wilson earned the complete game shutout. He allowed just three hits and struck out eight in the game. Backed up with some great defensive plays, Wilson retired 12 straight Eagle batters, three up and three down, in the last four innings. Clarksville, TN – Northwest High School’s baseball team took advantage of five West Creek High School errors, May 5th in the losers’ bracket of the District 10-AAA tournament at Clarksville High School’s baseball field, to score eight unearned runs in defeating the Coyotes, 8-6. The Vikings (7-25) will advance to the 4:30p.m. May 6th losers’ bracket finals to face Henry County High School, who lost to Clarksville High School on May 5th, 14-4, while West Creek (14-19) sees its season come to an end.